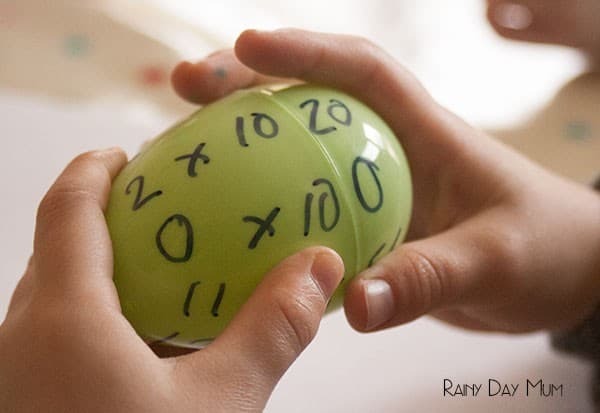 With our Easter Egg hunt over we are left with plastic eggs – I could be really Frugal and save them for next year but we’ve got homework to do over the Easter Break and with my eldest it’s our first foray into Times Tables – his homework to learn the 2, 5 and 10 times tables and if he masters those to challenge himself with the 3, 6 and 9. 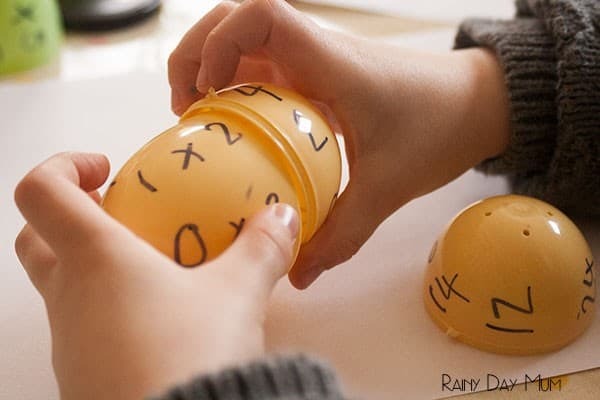 Using the plastic eggs I set up a small quick activity that he can do as his homework – multiplication eggs to help learn time tables. We have included affiliate links to the products we used and some extra resources to support learning the times tables. If you purchase via these links we may earn a small commission. Try our Build a Snowman Multiplication Game for some more hands-on times table learning. Split up the eggs and then rejoin – we used a mix of different colours. I set it up that all of the 2 times tables were in the same colour and then 5 on a different and 10 on the last. 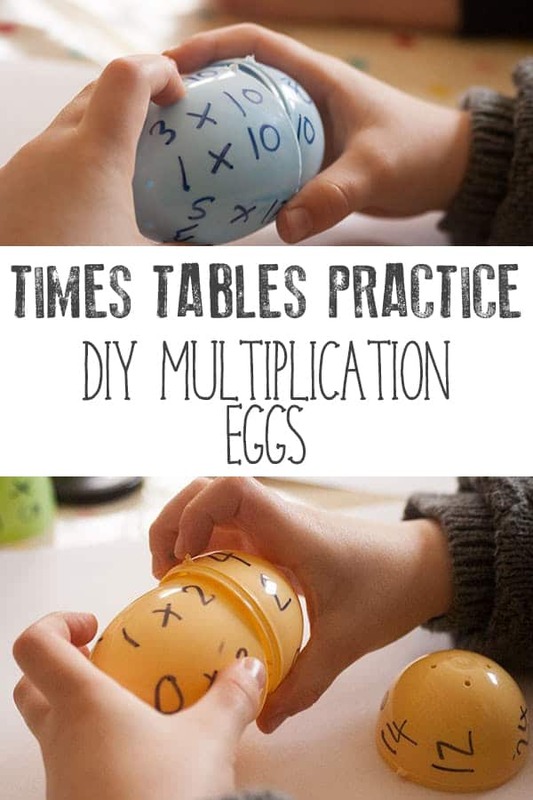 With the first half of the 2 times table, I put the times table in order so that he would get the hang of what was needed – 0 x 2, 1 x 2 etc and writing the answer on the bottom of the egg that could come apart. 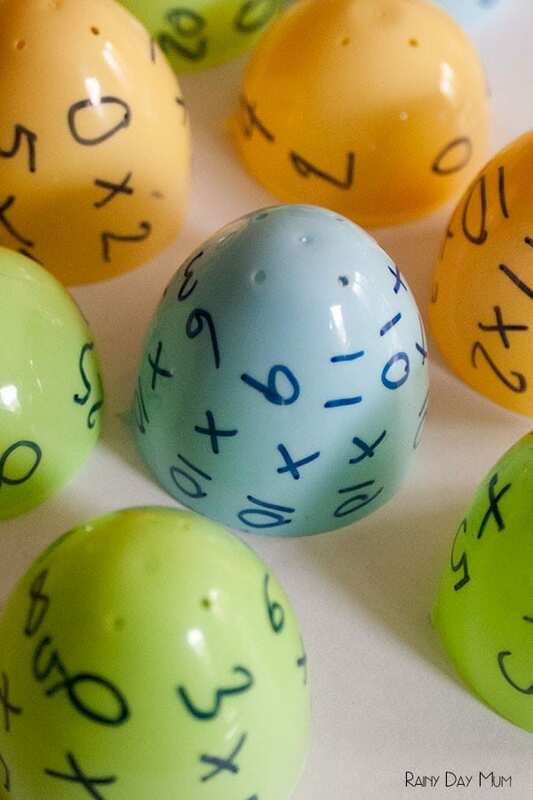 With all of the other eggs, I mixed up the times tables so that they didn’t go in order and he would have to think more about what numbers went with each sum. Use our Times Table inspired trees to review times tables as well. 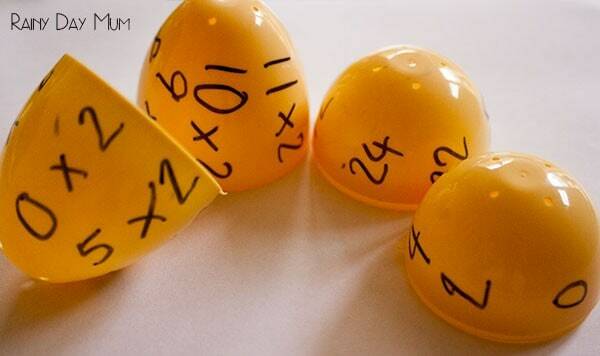 We have been reviewing the times tables and saying them out loud as well as writing them down but I know with him hands on activities are the best way to get him to remember the facts so I set out the yellow 2 times table eggs and he looked at the sums and tried to work out which base would join the eggs together best. With the correct egg joined he then twisted it around until he found the correct answer. 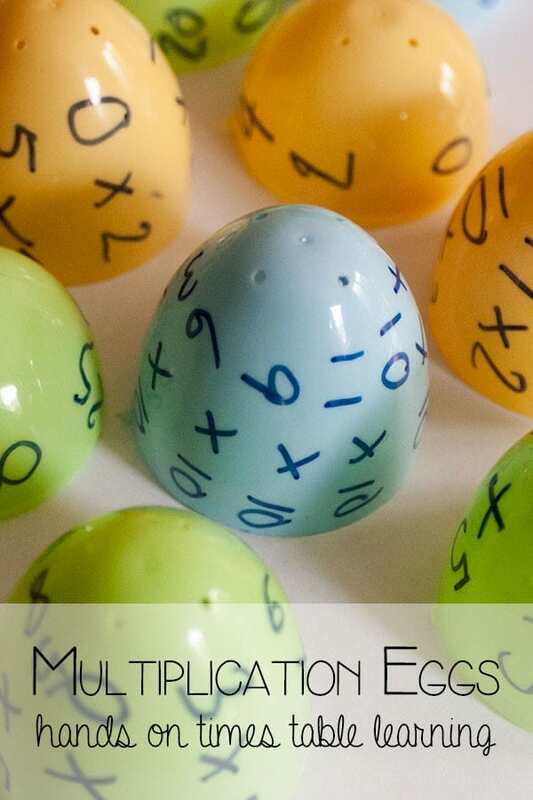 We then worked through the sums – I’m heading off to the store to collect some more eggs in the sales racks to complete a multiplication set for him and my youngest to use when the time comes. Use arrays to work on the number facts behind multiplication with our Acorn Arrays including printable acorns. Make use of Fact Families with these DIY Fact Family Triangles which can be used for multiplication and division or addition and subtraction. Similar to a hundred chart a multiplication chart or board can be used to help children to memorise the different times tables. 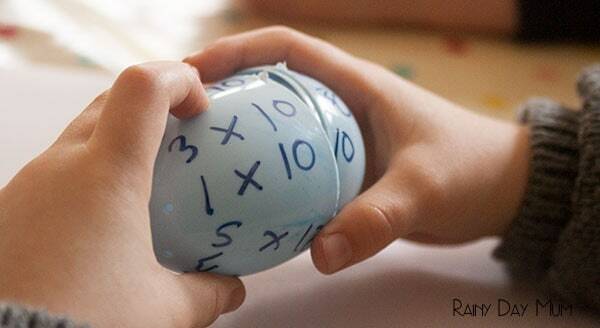 I like versions that are hands-on and this wooden board is great for children to use – you can use it as a game board or to practice the different times tables – this version only goes up to 9×9 but you can also get a version which works up to 12 x 12. Games are a great way to get kids learning as they add a little competition to get them working harder. This Flip It Tables game is fast-paced and ideal for working on times tables to 12.